With more than 54,000 inhabitants, Uddevalla is the largest city in Bohuslän and a centre for trade and industry, education, commerce and connections. The seaside location, close to the E6 between Gothenburg and Oslo is one of the municipality’s major advantages. It’s a node that works perfectly for trade and transports. The logistic advantages have been the reason for several businesses to base their headquarters and warehouses in Uddevalla. Trade and industry is diverse, with approximately 5,000 active businesses. Major sectors are commerce, the construction industry, building materials, and maritime operations. The geographic location has provided Uddevalla with a strong link to ship building and offshore industries. Today, mostly design and engineering are cutting edge fields. Where commerce is concerned, the municipality has very purposefully exploited its geographic advantages. The growth in the commercial sector has been very impressive, and the growth in Uddevalla has been among the largest in the region during the past 20 years. The commercial area Torp has been expanded several times and in the spring of 2013, amongst others Ikea have opened a department store here. Construction industry and building materials (many businesses, please refer to www.forreg.nu/uddevalla). Road and railway networks and the port play a central role in the flow of goods that goes to or through Uddevalla. The municipality offers a modern, ice-free industrial port that already today processes over a million tonnes of forestry products, bulk goods, and project and piece goods each year. The port has approximately 400 ships passing through each year, with extreme variations in terms of the number of ships that put to at the same time. Approximately 100 yearly workers, 2,400 metres of quays including two roll-on-roll-off-berths, a depth of 12 m, 10 km of tracks, 7 fixed and 3 mobile cranes with a lifting capacity of up to 66 tonnes, 60 lorries, 39,000 m² of warehousing surface, 580,000 m² of supporting surface. Uddevalla has one of the country’s largest upper secondary schools, and the University College Centre Bohuslän. Both schools cooperate with trade and industry in order to in the best possible way supply competences and to help students with their introduction into working life. Businesses that establish themselves in Uddevalla have good possibilities for placing themselves in an environment of strong growth. This applies to for instance those who are active in commerce, industry and marine applications, for which the expertise with already established companies is particularly high-level. Uddevalla has several existing commercial and industrial areas. It’s possible to find premises close to transit routes on land or water, whereby adaptations can be made for individual businesses’ needs. For businesses in the maritime sector, there may be possibilities for finding plots or premises in the immediate vicinity of the sea, depending on the type of operation. There’s a good cooperation between owners of premises and industrial plots in the municipality. The ambition is to always find the best possible location for incoming businesses. Tillväxt Uddevalla is an umbrella organisation for a number of networks and associations in the municipality. The point of departure is the will to cooperate instead of focusing on individual interests. This applies above all for matters that are of common interest to trade and industry in Uddevalla. There are plenty of places and forums where companies, politicians and schools meet to establish contacts in order to strengthen trade and industry. The Entreprenörsarenan, The university college centre Bohuslän and associations for small businesses provide good possibilities for networking and finding inspiration and knowledge for future entrepreneurial activities. With 260 km of coastline, Uddevalla has good possibilities for providing seaside rented, co-operative or freehold apartments or single-family homes. A large part of the city’s buildings are located close to the sea. For those who prefer not to live in the city, there are many options to choose from, such as farmsteads. 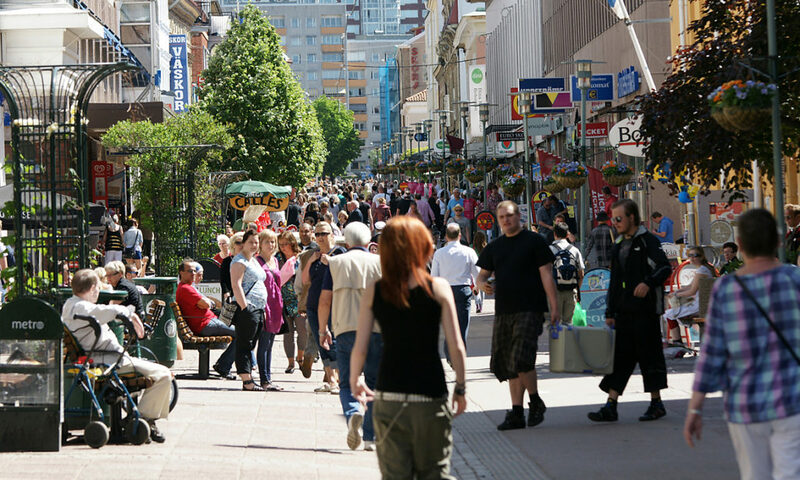 Uddevalla is expanding, and the capacity to welcome new inhabitants is high. In the middle of 2013, zoning plans existed for 700 new homes in different parts of the municipality. Everything you need is within close reach. The sea with the archipelago, open landscapes and untouched nature with tranquil lakes, in vast scaly landscapes. Uddevalla is situated along the E6, national highway 44, and has good railway connections. An airport for domestic flights is reached within 30 minutes by car, and getting to the nearest international airport takes a bit over an hour. There’s a lot going on, and it goes on all the time. On average, Uddevalla offers 5.2 cultural events per day on an annual basis. A lot of these events are about music, theatre, film and dance. The Bohuslän Museum attracts 300,000 visitors annually. It’s as much a location for many different activities as it is a provincial museum with exhibitions and art. Uddevalla also has the only seaman’s museum in Sweden, a shell bank museum, and a military museum. Moreover, there are several homeland museums. Where leisure activities are concerned, the proximity to the sea provides fabulous conditions for swimming, boating, fishing, camping and the like. Uddevalla’s beach promenade has been appointed “Sweden’s most beautiful street”, and is a tourist attraction in itself. In the wilderness in the hills to the west of Uddevalla, you’ll find both untouched nature and beautiful walking trails.